At a time when many facilities are deciding not to apply a finish to their warehouse floors because of budget – or are selecting floors that do not need a finish, again because of budget – there is one type of floor that should be finished for a variety of reasons. 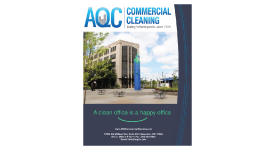 And it’s a floor that is usually at the bottom of the totem pole even in those facilities where floors are stripped, refinished, and burnished on a regular basis, according to Ilya our AQC floor care expert. The floor Ilya is referring to is the cement floor typically found in warehouses and other industrial areas of a facility. There are actually several reasons cleaning contractors should advise their clients to apply several coats of finish to a warehouse floor. Address repair issues. Typically when a cement warehouse floor is just cleaned and not finished, cracks and irregularities in the floor are allowed to develop, which get worse over time. These cracks and irregularities can become a safety issue. Typically, these problems are addressed and corrected before the floor is finished. Improves safety. By applying a floor finish with a high coefficient of friction (COF) rating it can help prevent slip-and-fall accidents. Brightens the location. A floor finish is designed to reflect light. The light reflection can make a warehouse area look brighter which provides a number of benefits: reduces lighting needs, promotes safety, and brightens worker morale. Easier maintenance. In general, it is easier to clean a floor that has a finish applied to it. The finish acts like a plate of glass, preventing soiling, stains, grease, and oil from penetrating the cement and making them easier to remove. Battery-powered sweepers and other floor care equipment are often more effective at collecting and removing dust and debris on a finished floor as well. Neater. Warehouse and other industrial locations have a tendency to get a little sloppy. However, with a high-gloss shine on the floors, workers tend to have more respect for the warehouse work area and ensure it is kept cleaner as well as better organized. Take a look at your warehouse floor, ponder the 5 reasons listed here and give AQC a call if we can help you! Ilya would love to come out and evaluate your needs!